In ancient Athens, a title of leadership was “Archon” (a lawgiver) and one of these men was named Draco. Apparently, he was so strict in the laws he passed that he gave us our word of the week. I never before heard of “draconic,” shown by the OED to mean a severe code of law or something that pertains to dragons (quite severe in their way). That word in turn gave us draconian, employed in English and some other languages for any really harsh law or penalty. Why the Star Trek image? 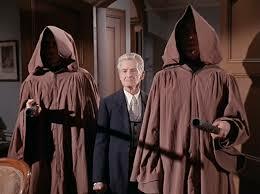 It’s from a favorite episode of mine, “The Return of the Archons,” largely about good intentions for law and order gone awry. In the show, a long-deceased scientist named Landru created an artificial intelligence (also called Landru) with elements of his personality encoded in the software. Landru keeps a planet’s populace in check with “Lawgivers” that impose peace by “absorbing” independent thinkers into “The Body” of obedient and docile, if brainwashed, citizens. Draconianism seems to work, for a time. Even Jim Kirk and his crew are nearly stifled by it, but in the end, draconian laws and codes fail. Landru blows a fuse. And as for Draco? Legends vary: he may have been smothered by his own supporters in a backfired attempt to show support for him, or he died in exile. Please nominate a word or metaphor useful in academic writing by e-mailing me (jessid -at- richmond -dot- edu) or leaving a comment below. See all of our Metaphors of the Month here and Words of the Week here. I love your blog! It is quite insightful! I would like to nominate the word Gibbous, as in Waxing Gibbous or Waning Gibbous! Such an odd sounding word for describing the phases of the moon. Excellent pick! I’ll put it in the queue.